A contemporary of Alex Riley, Frank Williams was a tracker who also received numerous accolades throughout his career. Williams was born in the country between Gundabooka and Toorale in the 1870s to Edward Williams and an Aboriginal woman named Fanny Hippi. He is associated with the Ngemba speaking peoples south of Bourke. After working as a labourer, he was appointed as the tracker at Dubbo on 1 March 1915, the first year of Riley’s temporary absence of the force.Police Salary Register 1915 SRNSW 3/2995 Reel 1974. The family also believe that Williams was casually employed as a tracker at Mount Drysdale near Cobar before moving to Dubbo. The salary register does not record He transferred to Byrock the following year before resigning on 16 May 1919. He re-joined just over 12 months later and was stationed at Byrock until March 1938 when he took up the tracker’s job at Bourke. Another 12 years on the job followed before Williams retired in May 1950, two months before Alex Riley left the force. …used to lie on skins. They used to have like a humpie, built right down, real traditional. He said this ‘walkabout’ that they reckon they used to do, he said they usen’t to. The only time they moved around was when they changed their camps, and that was for cleanness. They would shift around and get fresh ground.Cowlishaw 2006: 10. Dad used to go about with her and she used to show him a lot. She showed him how to track, so he ended up being a good tracker.Cowlishaw 2006: 11. A case which Williams received some press coverage at the time was the murder of Robert Whye (aka Bobbie Burns), a ten year old Aboriginal boy, on the banks of the Barwon River near Brewarrina Aboriginal Mission. The culprit was an older Aboriginal man from Brewarrina named Charlie McDonald and Williams was faced with the prospect of tracking his countryman. But his decision was made somewhat easier by the fact that he had strong familial ties to the victim. In June 1906, Frank Williams married Caroline Parker (aka Caroline Whye) at Brewarrina.MC of Francis Williams and Caroline Parker 1906/006754. Caroline was the daughter of Sam Parker of Coopers Creek, South Australia, and Caroline Hilt of Brewarrina, a fluent speaker of the Wailwan dialect of Ngiyampaa. She passed her linguistic knowledge on to her daughter and both were significant informants about Ngiyampaa language and culture for R.H. Mathews.R.H. Mathews Papers NLA MS 8006. Series 3. Folder 7. Notebook 7b Untitled:114. Caroline Hilt’s first marriage was to Alfred Whye, non-Indigenous, and her children to Cooper sometimes carried this surname.See DC of Caroline Parker 1917/003971. The young victim, Robert Whye, was born at Warren in 1919 to George Whye and Jane Francis McIntrye. His maternal grandmother was Caroline Hilt, making Caroline Parker his aunt, and in cultural terms, his mother. Although Charlie McDonald was from Brewarrina, it is not clear how he is related to the other families from the district. In a broad sense, Frank Williams was not stepping outside the bounds of tradition is seeing that McDonald was captured and punished for the murder. Other prominent members of the Brewarrina Aboriginal community were prepared to give evidence against McDonald, including Christy Warraweena (a Ngiyampaa speaker) and John Wilson (a cousin of Frank Williams). Other witnesses were children who were probably playing with Whye when he disappeared. In an interesting twist from the Governor episode, one of the witnesses was Annie Coombes, the daughter of Jack Coombes of Wollar and Lottie Governor (Jimmy and Joe’s sister). Her parents were part of the Wollar community which was removed to Brewarrina Aboriginal Station. They married at Brewarrina in October 1900 while the chase was still on and Annie was born about 10 years later. The following year she married Tom Wellington who was also a witness against McDonald.Tindale Brewarrina Genealogy, 1938; MC of Thomas Wellington and Annie Coombes 1927/009958; DC of Robert Whye 1926/001079. The pursuit itself was a difficult one. Rain soon after the murder obliterated most of the tracks, which at one stage led within less than a kilometre of Brewarrina Aboriginal Station. Although not mentioned in the press, Williams was assisted for some of the search by Alex Riley. But it was Williams alone who led the other police to a lonely shearer’s hut on Caringle Station where McDonald was arrested. Convicted of the murder at Dubbo, he was incarcerated in Goulburn Gaol where he passed away in 1928. Sydney Morning Herald 1 January 1926: 5; New South Wales Police Gazette 6 January 1926: 9; Sydney Morning Herald 8 January 1926: 11; Tracker Riley file, Macquarie Regional Library, Dubbo. I used to go out with grandfather a lot, especially on weekends. On Sundays we’d got out and kill a kangaroo and always bring back the tail. We never brought anything else back, just the tail. Granny would make a big pot of kangaroo tail soup. Oh it was beautiful. I used to always follow grandfather around! He used to sit down out the back and we’d talk about all sorts of things. He would show me how to draw figures in the dirt, things like lizards and frogs, you name it, and he could draw it.DEC 2005: 2. Williams was probably taught to track in a similar manner by his grandmother Maude. He was keen to pass the knowledge on: his son Sydney Williams also worked as a tracker. 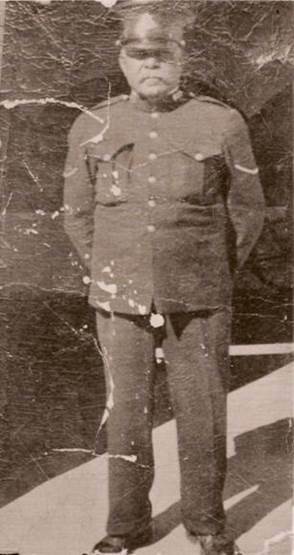 Frank Williams retired in 1950, having been promoted to the rank of Sergeant and given the King’s Medal in 1943. 2. ↑ Cowlishaw 2006: 10. 3. ↑ This information is significant given that there are no known examples of Aboriginal women working for NSW Police. It clearly demonstrates that Aboriginal women, not surprisingly, had the skills to track people in the bush. 4. ↑ Cowlishaw 2006: 11. 5. ↑ MC of Francis Williams and Caroline Parker 1906/006754. 6. ↑ R.H. Mathews Papers NLA MS 8006. Series 3. Folder 7. Notebook 7b Untitled:114. 7. ↑ See DC of Caroline Parker 1917/003971. 8. ↑ Tindale Brewarrina Genealogy, 1938; MC of Thomas Wellington and Annie Coombes 1927/009958; DC of Robert Whye 1926/001079. 9. ↑ Sydney Morning Herald 1 January 1926: 5; New South Wales Police Gazette 6 January 1926: 9; Sydney Morning Herald 8 January 1926: 11; Tracker Riley file, Macquarie Regional Library, Dubbo. 10. ↑ DEC 2005: 2.